As the AmeriCorps member for TLC, I am responsible for education, community outreach, and volunteer management. The spring weather has brought opportunity for outdoor environmental education programs, so I have been busy! Most of these programs are for our nonprofit partners, like Boys and Girls Club or East Durham Children’s Initiative, but they also include our monthly family series which is open to the public. Programming ramped up in early March and I will have on average one to two programs a week from now until the end of May. Program topics vary, but are related to our four public benefits of conservation. I have done programs on evaluating stream health, studying forest habitat and wildlife, and learning about pollinators and community gardens. 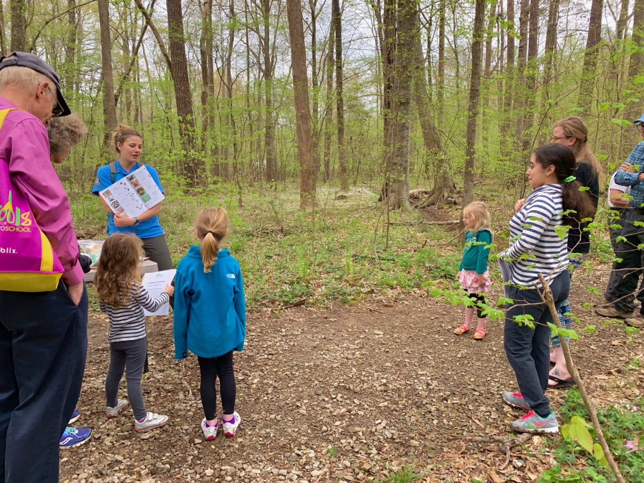 Third to fifth graders at Horton Grove Nature Preserve on March 23d, 2019. 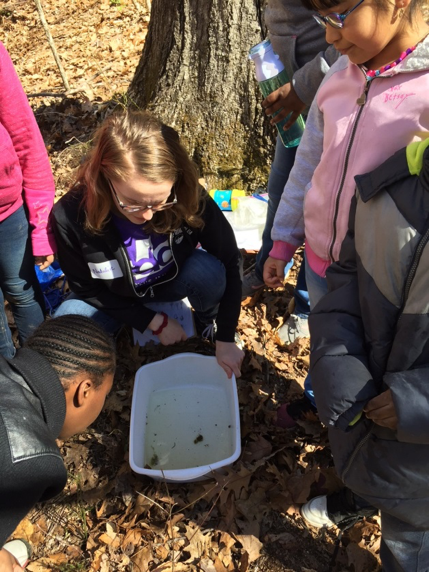 East Durham Children’s Initiative came out for their STEAM Saturday program and spent the morning learning about stream health. 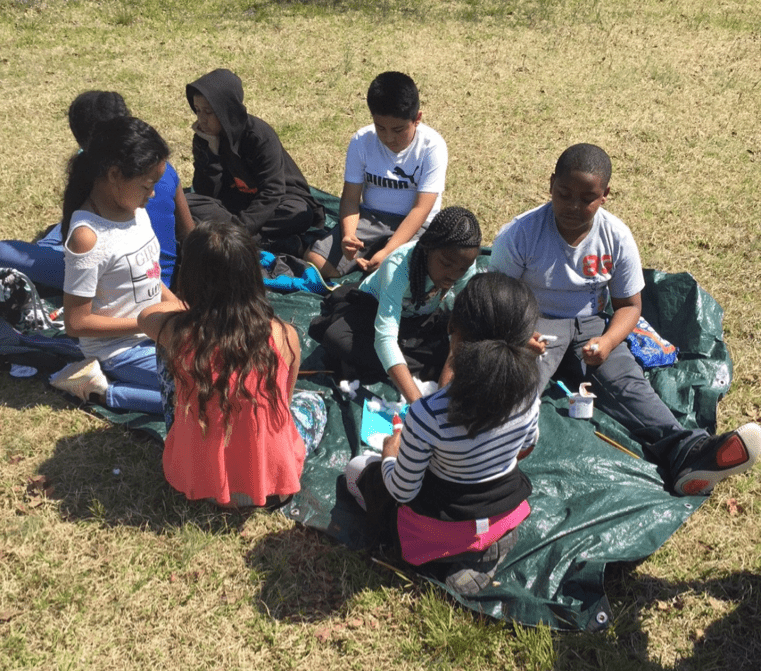 We talked about where the water on the preserve goes, why it is important to keep it clean, and how we can tell if the stream is healthy or not. On the left, the students are taking the temperature of the water. This was one of several water quality tests they performed. On the right, the students are observing a crawfish that they found in the creek. They had the opportunity to look for macroinvertebrates to determine the water quality. 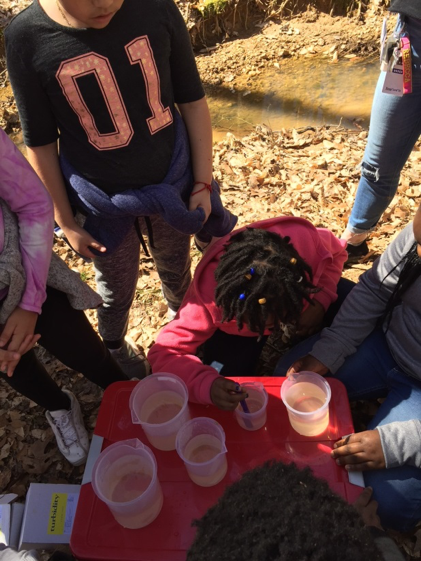 All of the students enjoyed navigating the stream bed to search for critters, and had fun learning about the implications of pH, temperature, and turbidity on stream health. Students from Partners for Youth Opportunity and Durham 4-H at Urban Community AgriNomics (UCAN) on March 27th. These high schoolers had a service learning day focusing on local farms and food through working on projects at a community garden. We discussed where their food comes from, how community gardens benefit the environment and the local community, and the importance of pollinators for food production. 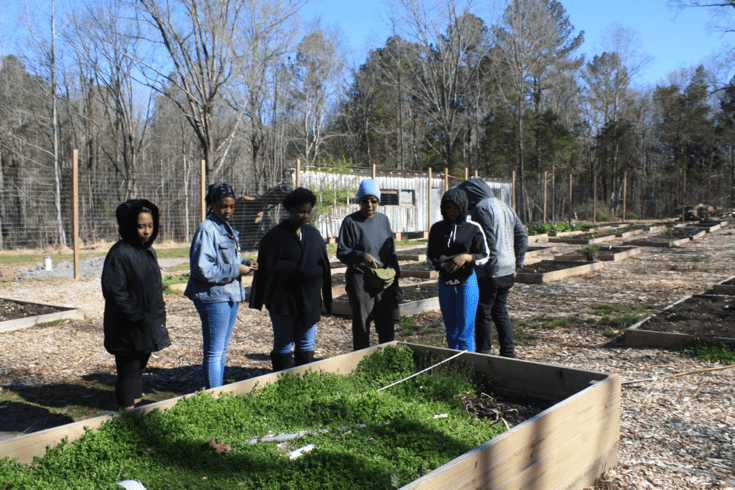 They also got a lot of information firsthand from UCAN founders Delphine Sellers and Lucille Patterson about their vision for the garden and the history of the land. The students planted a pollinator garden plot, turned over garden beds from last season, and added new compost to garden beds that needed to be topped off. We took a nature walk after lunch down an old trading road and discussed the history and ecology of the area. Everyone left dirty but happy with their work! 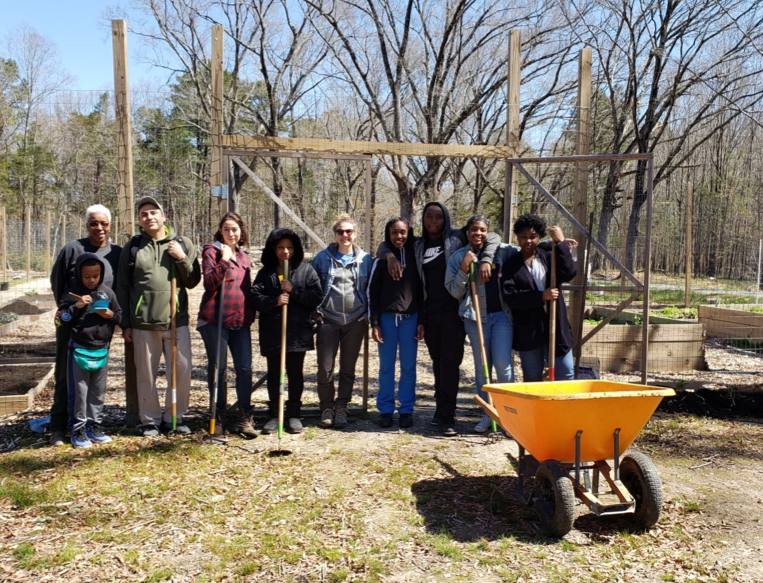 Brentwood Boys and Girls Club students at Walnut Hill Nature Preserve on March 29th. This group came out to Walnut Hill for a two hour program focusing on wildlife habitat. We had a scavenger hunt to complete with different aspects of habitat, and signs of wildlife that can be seen even when animals aren’t around. We took a nature walk to complete our scavenger hunt, and then the students were split into small groups to create a habitat for an animal of their choice using both natural and craft materials. They had to incorporate food, water, and shelter for their species. We discussed those habitat needs, and the reasons why certain animals would be found at Walnut Hill but not in the ocean, arctic, etc. They enjoyed looking around for signs of wildlife, and everyone was creative with their habitat construction! Get Wild! 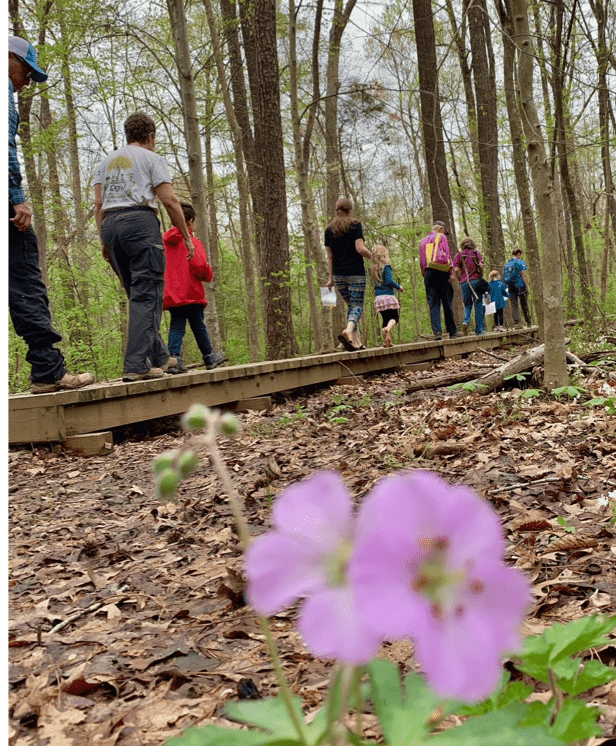 Nature Detectives family program at Swift Creek Bluffs Nature Preserve on April 7th. This series is open to the public and geared towards families with children ages 4-7. We had a warm day to explore Swift Creek Bluffs, and the recent spring weather meant that all of the wildflowers were in full bloom. This program was similar to the one at Walnut Hill, but focused on forest habitats and the animals in them. We discussed what signs of wildlife we might see and took a walk to look for those signs. Afterwards the kids created their own “track stories” with stamps, and made take home tracks with Model Magic. Everyone was a successful nature detective!